My use of clean, pure geometric forms for my contemporary mantel clocks allows the qualities of their unique gilded finishes to be shown off to best advantage. These innovative new finishes change according to the angle that are viewed from & the ambiant light. The tarnishing process means each finish subtly differs on each clock making each mantle clock truly unique. I've grouped my mantle clocks below according to the different type of dial. Click on the contemporary mantel clock design that you are interested in to for further detail. 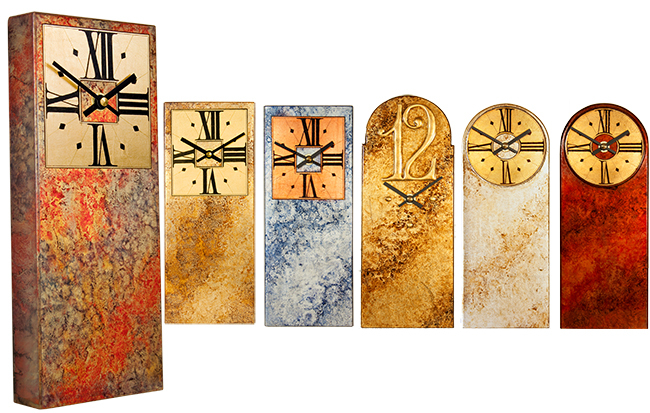 What makes my contemporary mantle clocks so interesting and different from any other are their gilded finishes. Imagine a finish that has the iridescent beauty of a butterfly's wing and come in a whole new spectrum of colours that stimulates the eye and fire the imagination. Their unique reflective qualities means the mood, tone and colour of my contemporary mantel clocks subtly change, depending on the light and angle the mirror is viewed from. To show these exciting dynamic qualities off to best advantage I have used simple geometric forms, made up from angular planes, so that the light plays off the surfaces of the mantle clocks, producing these iridescent qualities. So if you require a gold mantle clock or silver mantel clock my new exciting new range of tarnished leaf finishes will have something for you!